A man who lurks in the shadows of Brampton, Ont. is now fighting crime in his very own Batmobile. Silent guardian Stephen Lawrence has dressed as Batman for years, and helps out the residents of Brampton when he can. Besides helping people change tires, and keeping his eyes peeled for crime, the 38-year-old has posed for countless photos. 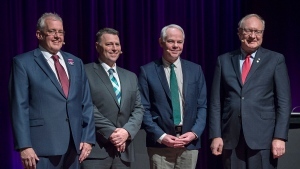 When he was 17, he was awarded a civilian citation by the York Regional Police for tackling someone who tried to use a fake credit card at a mall. It was later discovered the man he stopped was wanted for fraud on a Canada-wide warrant. And his heroics didn't stop there. In college, he gave CPR to a person he saw collapse, and caught another would-be thief in St. Catharines. He now works a manufacturing shift from 2 p.m. to 10 p.m., then puts on his mask and hits the streets as "Brampton Batman." Lawrence bought the converted sedan-turned-Batmobile in November, but didn't start driving it until the snow cleared in April. The car was modified to include a long, narrow nose and high, matte black wings in the back. The car is low to the ground, and the vanity licence plate reads "DRKNIGHT." "You do have to learn to drive the Batmobile," Lawrence told CTV's Canada AM in a gravelly voice, mimicking the character. "It took me about a solid week just to get used to it, so that you don't hit curbs and other cars." Though the Batmobile is a regular car inside, Lawrence claims he can attach Gatling guns and make fire shoot out the back, but says that would be illegal, so he won't. 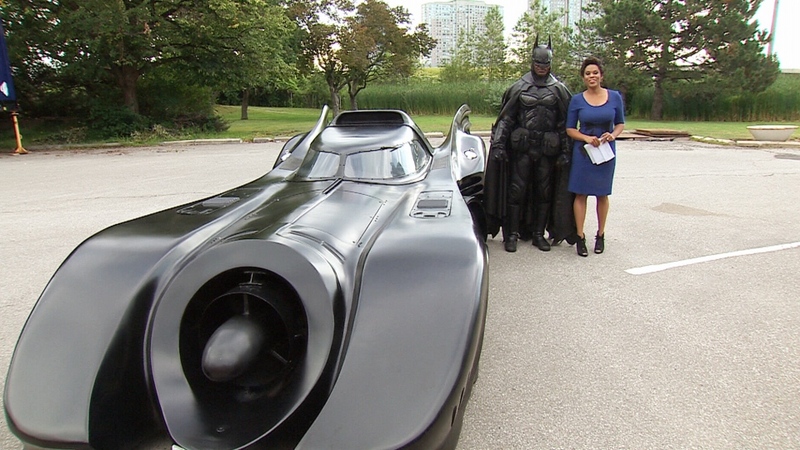 Brampton Batman poses with CTV's Canada AM host Marci Ien in Toronto on Thursday, July 31, 2014.